Dubrovnik... I'll be back again!! In March 2009 I left Brazil towards Venice onboard the ship MSC ARMONIA on a transatlantic cruise. I spent only a single day in Dubrovnik. I loved the city, it was beautiful, the sky was very blue, (what a sun! ), the historic buildings...everything was great! But what gave me the certainty that I will return to Croatia with more free time, was the friendliness of the people with whom I had contact. Especially the waiter and the owner (a lady) of the Proto Restaurant, where I could relax and have some beer and a plate of local cheese after walking through the city. Both of them are nice people, and they made me feel as if I was in my own home. I will return for sure! Hugs from Rio de Janeiro. Comments for Dubrovnik... I'll be back again!! you are so right, apart from being a beautiful place, Dubrovnik and Croatia in general are known for friendly and down-to-earth people! 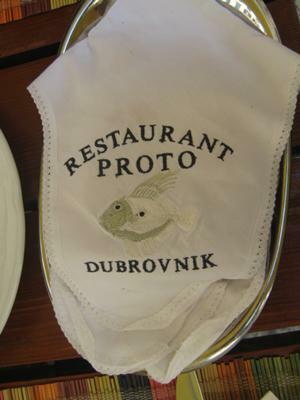 I am not surprised Proto turned out to be your favorite place to dine, Ralph and I love it too and so do many other people, even celebrities who visited it (Bono from the U2, Richard Gere...). Join in and write your own page! It's easy to do. How? Simply click here to return to Dubrovnik Surprise.